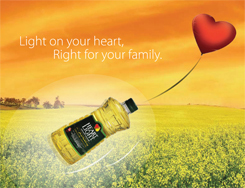 Heartlight is 100 percent canola oil with lowest saturated fat compared to any other cooking oil. Richer in Alpha-Lenolenic acid which helps reduce blood cholestrol, Heartlight is perfect for cooking, frying, baking and simply delicious on salads! For a healthy lifestyle, change to Heartlight Canola Oil. Processed and packed in Canada.